Deshaun Watson made his NFL debut Wednesday night, and he made a nice impression with a touchdown run. Tom Savage has been the nominal starter for the Houston Texans through offseason work and training camp, but teams typically don’t trade up in the draft for a quarterback without giving him an immediate opportunity to start. Deshaun Watson was Houston’s target in the first round of April’s draft, and he’ll surely make regular season starts this year at some point. Savage has taken every first-team practice rep thus far in training camp, so it’s no surprise he started Wednesday night’s preseason opener against the Carolina Panthers. He led a touchdown drive in two series of action, going 9-for-11 for 69 yards. But Watson brings the kind of athleticism to the table Savage just doesn’t (or can’t). Deep in the third quarter against the Panthers, Watson showed it off by escaping the pocket and taking off. 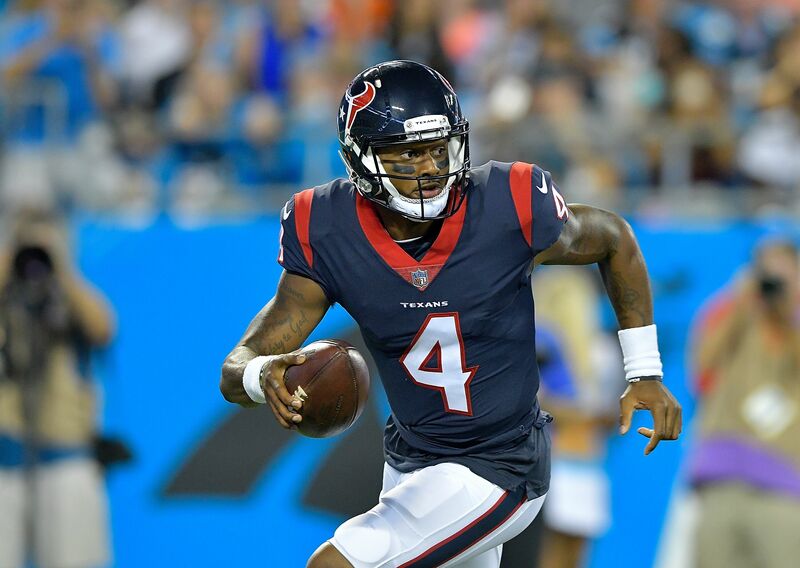 With a 15-yard run, Watson scored his first NFL touchdown. Don’t say it’s a completely meaningless preseason game either, as Watson went 15-for-25 for 179 yard to go along with his 24 rushing yards in extensive action against Carolina. He did take three sacks, but overall it was a solid NFL debut for the third quarterback drafted this year. As of right now, Savage is likely to start Week 1 for the Texans. But head coach Bill O’Brien seems open to the idea of Watson winning the job right out of gate, and it seems likely he’ll start Houston’s second preseason game in order to get some time with the first team offense. If Watson doesn’t get the starting nod against the Patriots on Aug. 19, that will be a further sign of commitment to Savage as the guy to start the season. But Watson has more than enough talent to usurp him before too long.